2011-11-17 Application filed by Fresenius Medical Care Holdings, Inc. filed Critical Fresenius Medical Care Holdings, Inc.
Systems and sensor clip assemblies for optically monitoring blood flowing through a blood chamber are provided. A sensor clip assembly includes emitters and photodetectors positioned on opposing arms, a signal conditioning circuit for conditioning raw analog signals generated by the photodetectors while the sensor clip assembly is fastened to a blood chamber, and an analog-to-digital converter for converting the conditioned analog signals to raw digital data. The sensor clip assembly may output the raw digital data to an external device and receive synchronized control signals from the external device, or the sensor clip assembly may include a microcontroller for performing calculations on the raw digital data and providing synchronized control signals internally. Parameters of blood flowing through the blood chamber such as hematocrit, oxygen saturation, and change in blood volume may be calculated from the raw digital data derived from the raw analog signals generated by the photodetectors. This patent application is a continuation-in-part of copending U.S. Patent Application No. 13/030,212, filed February 18, 201 1 , which claims the benefit of U.S. Provisional Patent Application No. 61/414,654, filed November 17, 2010, both of which are incorporated by reference in their entireties. This patent application also claims priority to U.S. Provisional Application No. 61/553,078, filed October 28, 201 1 , and U.S. Application No. 13/034,788, filed February 25, 201 1 , both of which are incorporated by reference herein in their entireties. The invention relates to optical monitoring systems, and more specifically systems for monitoring the presence or concentration of constituents in blood. The invention is particularly useful for the real-time measurement of hematocrit and/or oxygen saturation levels when monitoring a patient during hemodialysis or other procedure involving extracorporeal blood flow. Patients with kidney failure or partial kidney failure typically undergo hemodialysis treatment in order to remove toxins and excess fluids from their blood. To do this, blood is taken from a patient through an intake needle or catheter which draws blood from an artery or vein located in a specifically accepted access location - - e.g., a shunt surgically placed in an arm, thigh, subclavian and the like. The needle or catheter is connected to extracorporeal tubing that is fed to a peristaltic pump and then to a dialyzer that cleans the blood and removes excess fluid. The cleaned blood is then returned to the patient through additional extracorporeal tubing and another needle or catheter. Sometimes, a heparin drip is located in the hemodialysis loop to prevent the blood from coagulating. As the drawn blood passes through the dialyzer, it travels in straw-like tubes within the dialyzer that serve as semi-permeable passageways for the unclean blood. Fresh dialysate solution enters the dialyzer at its downstream end. The dialysate surrounds the straw-like tubes and flows through the dialyzer in the opposite direction of the blood flowing through the tubes. Fresh dialysate collects toxins passing through the straw-like tubes by diffusion and excess fluids in the blood by ultra filtration. Dialysate containing the removed toxins and excess fluids is disposed of as waste. The red cells remain in the straw-like tubes and their volume count is unaffected by the process. An optical blood monitoring system is often used during hemodialysis treatment or other treatments involving extracorporeal blood flow. One example is the CRIT-LINE® monitoring system sold by Fresenius USA Manufacturing, Inc. of Waltham, MA. The CRIT- LINE® blood monitoring system uses optical techniques to non-invasively measure in real-time the hematocrit and the oxygen saturation level of blood flowing through the hemodialysis system. The blood monitoring system measures the blood at a sterile blood chamber attached inline to the extracorporeal tubing. In general, blood chambers along with the tube set and dialyzer are replaced for each patient. The blood chamber is intended for a single use. The blood chamber defines an internal blood flow cavity comprising a substantially flat viewing region and two opposing viewing lenses. LED emitters and photodetectors for the optical blood monitor are fastened (e.g., by clipping) into place onto the blood chamber over the lenses. Multiple wavelengths of light may be resolved through the blood chamber and the patient's blood flowing through the chamber with a photodetector detecting the resulting intensity of each wavelength. Hematocrit Monitoring," which issued on December 13, 1999 and is assigned to the assignee of the present application, uses this light intensity information to calculate the patient's hematocrit value in real-time. The hematocrit value, as is widely used in the art, is a percentage determined by the ratio between ( 1 ) the volume of the red blood cells in a given whole blood sample and (2) the overall volume of the blood sample. In a clinical setting, the actual percentage change in blood volume occurring during hemodialysis can be determined, in real-time, from the change in the measured hematocrit. Thus, an optical blood monitor is able to non-invasively monitor not only the patient's hematocrit level but also the change in the patient's blood volume in real-time during a hemodialysis treatment session. The ability to monitor real-time change in blood volume helps facilitate safe, effective hemodialysis. To monitor blood in real time, light emitting diodes (LEDs) and photodetectors for them are mounted on two opposing heads of a sensor clip assembly that fit over the blood chamber. For accuracy of the system, it is important that the LEDs and the photodetectors be located in a predetermined position and orientation each time the sensor clip assembly is clipped into place over the blood chamber. The predetermined position and orientation ensures that light traveling from the LEDs to the photodetectors travels through the lenses of the blood chamber. The optical monitor is calibrated for the specific dimensions of the blood chamber and the specific position and orientation of the sensor clip assembly with respect to the blood chamber. For this purpose, the heads of the sensor clips are designed to mate to the blood chamber so that the LEDs and the photodetectors are at a known position and orientation. In the CRIT-LINE® monitoring system, the head of the sensor clips and the blood chamber have complementary D-shaped configurations. In conventional systems, the optical monitoring is performed by a stand-alone controller that includes a display that presents the monitoring data in real-time. The controller includes a processor that calculates the displayed data and controls the operation of the LEDs and photodetectors. The controller is conventionally connected to the sensor clip and the optical devices via a tethering cable. A significant amount of noise is introduced to the analog signal provided by the photodetectors during transmission through a cable to the stand-alone controller, and the amount of power required to illuminate the LEDs to compensate and ensure a useable analog signal generates heat which degrades the lifetime of the LEDs. Furthermore, photodiode currents are so small that any series resistance in its connection is an attenuator and potential noise source. The longer the cable for the analog signal, the more resistance there is to the current and the more noise there will be in the signal. In an embodiment of the present invention, a sensor clip assembly for optically monitoring blood flowing through a blood chamber is provided. The sensor clip assembly includes: a housing having two opposing arms capable of being fastened to a blood chamber; at least one emitter in one of the opposing ends; at least one photodetector in the other opposing end positioned relative to the at least one emitter such that light emitted by the at least one emitter is capable of being received at the at least one photodetector after passing through a blood chamber to which the sensor clip assembly is fastened; a microcontroller within the housing configured to receive conditioned analog signals, wherein the conditioned analog signals are based on raw analog signals generated by the at least one photodetector, to convert the conditioned analog signals to raw digital data, and to calculate at least one parameter corresponding to blood in a blood chamber to which the sensor clip assembly is fastened based on the raw digital data; and an output port configured to output from the sensor clip assembly results of calculations performed by the microcontroller to an external device. The sensor clip assembly may further include at least one transimpedence amplifier within the housing corresponding to each photodetector for converting raw analog signals to analog voltage signals; and at least one digitally-controllable trimpot within the housing corresponding to each photodetector for applying a gain to the analog voltage signals. The microcontroller may be further configured to control operation of the at least one emitter, and to control the gain applied by the at least one digitally-controllable trimpot in a manner that is synchronized with the operation of the at least one emitter. At least one of the emitter arm and the photodetector arm may include a shroud for blocking ambient light from being received at the at least one photodetector. The sensor clip assembly may further include a silicon photodetector and an Indium- Gallium-Arsenide photodetector, and the microcontroller may further be configured to calculate a hematocrit value, an oxygen saturation value, and a percent blood volume change. The output port of the sensor clip assembly may correspond to a USB (Universal Serial Bus) connection, and the external device may be a computer. The output port may further be configured to transmit commands received from the external device to the microcontroller. Further, the microcontroller may be configured to verify the accuracy of the sensor clip assembly based on a unique verification filter, and to recalibrate the sensor clip assembly upon confirming user input of a correct verification filter identification code. The microcontroller may further be part of a board floated within one of the two opposing arms. In another embodiment, a system for optically monitoring blood is provided. The system includes: a blood chamber comprising a viewing window and a chamber body; a sensor clip assembly fastened to the blood chamber, the sensor clip further including a housing having an emitter arm and a photodetector arm, at least one emitter within the emitter arm, at least one photodetector within the photodetector arm positioned relative to the at least one emitter such that light emitted by the at least one emitter is capable of being received at the at least one photodetector after passing through the blood chamber, a microcontroller within the housing configured to receive conditioned analog signals, wherein the conditioned analog signals are based on raw analog signals generated by the at least one photodetector, to convert the conditioned analog signals to raw digital data, and to calculate at least one parameter corresponding to blood in a blood chamber to which the sensor clip assembly is fastened based on the raw digital data, and an output port configured to output results of calculations performed by the microcontroller from the sensor clip assembly to an external device; and the external device, configured to display the results of the calculations performed by the microcontroller to a user. The emitter arm and the photodetector arm may further be opposing arms biased together at first opposing ends of the arms to form a jaw such that a pinching force applied to second opposing ends of the arms opens the jaw to allow the blood chamber to placed between the first opposing ends and held there when the force is removed. The chamber body of the blood chamber may be tinted blue so as to block ambient light from being received at the at least one photodetector. The system may further include a verification filter uniquely associated with the sensor clip assembly for determining whether recalibration of the sensor clip assembly is needed. The output port may be further configured to transmit commands received from the external device to the microcontroller; and the microcontroller may be further configured to verify accuracy of the sensor clip assembly based on the verification filter and to recalibrate the sensor clip assembly upon confirming user input of a correct verification filter identification code. The microcontroller may further be part of a board floated within one of the emitter arm and the photodetector arm. In yet another embodiment, a sensor clip assembly having a microcontroller, an emitter, and a photodetector, with the microcontroller further including a processor and a tangible, non-transient computer-readable medium having computer-executable instructions for optically monitoring blood stored thereon is provided. The computer-executable instructions include: instructions for turning the emitter on, wherein the emitter corresponds to the photodetector; instructions for synchronizing conditioning of raw analog signals generated by the photodetector on a channel corresponding to the photodetector with operation of the emitter; instructions for calculating at least one parameter corresponding to blood based on raw digital data converted from conditioned analog signals, wherein the conditioned analog signals are based on the raw analog signals generated by the photodetector; and instructions for outputting results of calculations to an external device via an output port. corresponding command from the external device, instructions for receiving a user input of a verification filter identification code; instructions for recalibrating the sensor clip assembly if the verification filter identification code input by the user corresponds to the verification filter uniquely associated with the sensor clip assembly, and/or instructions for outputting status information corresponding to the sensor clip assembly to the external device. The computer- executable instructions for outputting results of calculations to an external device via an output port may further include instructions for outputting a data stream including information pertaining to a hematocrit value, an oxygen saturation value, and a percent blood volume change. In yet another embodiment, a sensor clip assembly for optically monitoring blood flowing through a blood chamber is provided. The sensor clip assembly includes: a housing having two opposing arms capable of being fastened to a blood chamber; means for fastening the housing to the blood chamber; at least one emitter in one of the opposing ends; at least one photodetector in the other opposing end positioned relative to the at least one emitter such that light emitted by the at least one emitter is capable of being received at the at least one photodetector after passing through a blood chamber to which the sensor clip assembly is fastened; a signaling conditioning circuit configured to apply a gain to and to filter noise from raw analog signals generated by the at least one photodetector; an analog-to-digital converter configured to convert conditioned analog signals to raw digital data; and an output port configured to connect the sensor clip assembly to an external device. microcontroller may be further configured to recalibrate the sensor clip assembly upon confirming user input of a correct verification filter identification code. The microcontroller may further be part of a board floated within one of the two opposing arms. In yet another embodiment, a system for optically monitoring blood is provided. The system includes: a blood chamber comprising a viewing window and a chamber body; a sensor clip assembly fastened to the blood chamber, the sensor clip assembly a housing having an emitter arm and a photodetector arm, at least one emitter within the emitter arm, at least one photodetector within the photodetector arm positioned relative to the at least one emitter such that light emitted by the at least one emitter is capable of being received at the at least one photodetector after passing through the blood chamber, a signaling conditioning circuit configured to apply a gain to and to filter noise from raw analog signals generated by the at least one photodetector, an analog-to-digital converter configured to convert conditioned voltage analog signals to raw digital data, and an output port configured to connect the sensor clip assembly to an external device; and the external device, configured to receive data from the sensor clip assembly via the output port. The signaling conditioning circuit may further include at least one transimpedence amplifier, at least one digital trimpot, and a filter circuit. At least one of the photodetector arm and the emitter arm may include a shroud for blocking ambient light from being received at the at least one photodetector. The chamber body of the blood chamber may be tinted blue so as to block ambient light from being received at the at least one photodetector. microcontroller may further be part of a board floated within one of the emitter arm and the photodetector arm. In an alternative further embodiment, the external device is further configured to receive the raw digital data from the sensor clip assembly via the output port and to calculate at least one parameter corresponding to blood in a blood chamber to which the sensor clip assembly is fastened based on the digital data. The external device may be further configured to verify accuracy of the sensor clip assembly based on a verification filter uniquely associated with the sensor clip assembly, and to recalibrate the sensor clip assembly upon confirming user input of a correct verification filter identification code. In yet another embodiment, a computing device connected to a sensor clip assembly having an emitter, a photodetector, a signal conditioning circuit, and an analog-to-digital converter is provided. The computing device includes a processor and a tangible, non-transient computer-readable medium having computer-executable instructions for optically monitoring blood stored thereon. The computer-executable instructions include: instructions for turning the emitter on, wherein the emitter corresponds to the photodetector; instructions for synchronizing operation of the signal conditioning circuit with operation of the emitter corresponding to the photodetector; instructions for receiving, from the sensor clip assembly, raw digital data converted by the analog-to-digital converter from conditioned analog signals based on raw analog signals generated by the photodetector; and instructions for calculating at least one parameter corresponding to blood based on the raw digital data. The computer-executable instructions may further include instructions for controlling an amount of gain applied by the signal conditioning circuit, instructions for verifying accuracy of the sensor clip assembly based on a verification filter uniquely associated with the sensor clip assembly, instructions for receiving a user input of a verification filter identification code, and/or instructions for recalibrating the sensor clip assembly if the verification filter identification code input by the user corresponds to the verification filter uniquely associated with the sensor clip assembly. The computer-executable instructions for calculating at least one parameter corresponding to blood based on the raw digital data may further include instructions for calculating a hematocrit value, an oxygen saturation value, and a percent blood volume change corresponding to the blood. FIG. 1 is a block diagram of an exemplary environment depicting a patient undergoing hemodialysis treatment. FIG. 2 is a perspective view of a blood chamber. FIG. 3 is a perspective view of a sensor clip assembly. FIG. 4 is a perspective view of a sensor clip assembly clipped to a blood chamber. FIG. 5 is an internal view of a sensor clip assembly depicting internal components of the sensor clip assembly. FIG. 6 is a schematic diagram of a cross-section of a sensor clip assembly. FIG. 7 is flowchart depicting a process for collecting, processing, and outputting data. FIG. 8 is a block diagram of components of a sensor clip assembly. FIG. 9 is a functional block diagram of components of a sensor clip assembly according to the embodiment illustrated in Fig.8. Fig. 10 is a functional block diagram of components of a sensor clip assembly according to an alternative embodiment. Fig. 1 1 is a timing diagram for powering LEDs in the sensor clip assembly and collecting data from complementary sensors. FIG. 12 is a screen capture of an exemplary demo software interface on a computer in communication with a sensor clip assembly. FIGS. 13A- 1 3F are screen captures of an exemplary software interface for commercial use on an external host device in communication with a sensor clip assembly pertaining to verification and recalibration. An exemplary environment suitable for various implementations of the present invention is described with reference to FIG. 1 . The exemplary environment 100 of FIG. 1 schematically represents a system where a patient 10 is undergoing hemodialysis treatment with a sensor clip assembly 34 monitoring the patient's blood in real-time as it passes through extracorporeal tubing in the hemodialysis system utilizing a conventional blood chamber and sensor clip assembly. It will be appreciated that the described environment is an example and that components of the environment may be varied or modified without departing from the teachings contained herein. An input needle or catheter 16 is inserted into an access site of the patient 10, such as a shunt in the arm, and is connected to extracorporeal tubing 1 8 that leads to a peristaltic pump 20, part of a hemodialysis machine 12, and then to a dialyzer or blood filter 22. The dialyzer 22 removes toxins and excess fluid from the patient's blood. The dialysized blood is returned from the dialyzer 22 to the patient through extracorporeal tubing 24 and a return needle or catheter 26. The extracorporeal blood flow in the United States generally receives a heparin drip to prevent clotting although that is not shown in Fig. 1 . Excess fluids and toxins are removed by clean dialysate liquid which is supplied to the dialyzer 22 via tube 28 and removed for disposal via tube 30. A typical hemodialysis treatment session in the United States takes about 3 to 5 hours. In a typical hemodialysis treatment as described in Fig. 1 , the access site draws arterial blood from the patient. If no arterial access is available then a venous catheter may be used to access the patient's blood. As mentioned, other dialysis applications such as low flow Continuous Renal Replacement Therapy (CRRT) sometimes used in the Intensive Care Unit or applications such as high-flow perfusion measurements during cardiac surgery also measure blood from the patient. Applications include closed-loop blood flow devices such as conventional dialysis machines, but also may include applications with cyclical blood-cleaning devices such as the "single-needle" dialysis technique. Current art indicates that oxygen saturation levels in venous blood correlate to the cardiac output for the patient. Optical blood monitoring is performed by the sensor clip assembly 34, which is fastened to a blood chamber 32. While fastening is described herein with respect to "clipping" via a spring-biased bridge, it will be appreciated that the sensor clip assembly is not required to be a "clip" and may be fastened in a variety of ways, such as through use of a plug-in connector, a snap-in connector, different types of hinges, and other types of fastening mechanisms known to those skilled in the art. Digital data, which may be raw digital data (i.e., representing readings from photodetectors of the sensor clip assembly which have been conditioned and converted to digital form) or processed digital data (i.e., representing calculations based on the readings from the photodetectors of the sensor clip assembly), is output from the sensor clip assembly 34 through an appropriate digital processing port such as a USB port. The blood chamber 32 is preferably located in line with the extracorporeal tubing 18 upstream of the dialyzer 22, although it can be located anywhere in the blood line. Blood from the peristaltic pump 20 flows through the tubing 1 8 into the blood chamber 32. In an embodiment, the sensor clip assembly 34 includes LED photoemitters that emit light at substantially 810 nm, which is isobestic for red blood cells, substantially 1300 nm, which is isobestic for water, and at substantially 660 nm, which is sensitive for oxygenated hemoglobin. The blood chamber 32 includes windows so that the sensor emitters and detector(s) can view the blood flowing through the blood chamber 32, and determine the patient's real-time hematocrit value and oxygen saturation value using known ratiometric techniques. It will be appreciated that other types of emitters may be used other than LED emitters, such as laser diodes or a white light source in combination with a prism. FIGS. 2-4 show the blood chamber 32 and sensor clip assembly 34 in one specific embodiment. Referring to FIG. 2, the body 301 of the blood chamber 32 is made of molded, medical grade, blue-tinted polycarbonate or other suitable material. The viewing window 306 on the chamber body 301 is preferably made of clear, medical grade polycarbonate material which is molded with a polished finish in order to facilitate reliable light transmission, e.g. Bayer Makrolon FCR2458-551 15 (no regrind allow), which is blood contact approved, USP XXI 1 , Class V I . It is expected that the material be certified as to grade number, lot number and date of manufacture. Although only one side of the blood chamber 32 is depicted by FIG. 2, both sides of the blood chamber 32 include lenses 305 having viewing windows. As seen in FIG. 2, each lens 305 includes two concentric rings of ridges, and the inner ring surrounds the viewing window 306 of the lens 305. The outer ring is at the periphery of the lens 305 where the lens mates to the chamber body 301 . The annular surface area of the lens 305 between the inner and outer rings defines a recess for receiving the shroud of the sensor clip assembly. When mated, the recess and the spring bias of the clip assembly hold the sensor clip assembly 34 and blood chamber 32 together, as will be described in further detail below. To prevent relative rotation of the clip and the blood chamber, a finger 307 extends radially inwardly from the ridge of the outer ring. This finger 307 mates to a notch in the shroud and serves to rotationally lock the mated clip assembly and blood chamber. The inlet and outlet of the blood chamber 32 are designed to be compatible with standard medical industry connecting devices, conventionally known as luer lock connectors. Alternatively, one or both of the inlet and outlet may be configured to include an opening that accepts the outer circumference of corresponding tubing. Further detail regarding the configuration and design of the blood chamber 32 can be found in U.S. Provisional Application No. 61 /553,078, U.S. Application No. 13/034,788, and U.S. Application No. 12/876,572. FIG. 3 depicts an external view of the sensor clip assembly 34, and FIG. 4 provides an example of the sensor clip assembly 34 clipped onto the blood chamber 32. The sensor clip assembly 34 monitors the patient's blood flowing through the blood chamber 32 (e.g., hematocrit, hemoglobin, change in blood volume and oxygen saturation level, and/or other blood constituents of blood flowing through the blood chamber 32). The casing of the sensor clip assembly 34 includes an LED emitter arm 344 and a photodetector arm 346, which are connected via a spring biased bridge 348. The LED emitter arm 344 contains an emitter subassembly with at least two LED emitters, one emitting infrared light radiation at a first wavelength (λι) of about 1300 nm and another emitting infrared light radiation at a second wavelength (λ2) of about 810 nm. The LED emitter preferably also includes a third LED emitter for emitting visible light radiation at a third wavelength (λ3) of about 660 nm. Other wavelengths could be substituted or added to measure additional blood constituents or properties of other fluids. The detector arm 346 contains preferably two types of photodetectors: a silicon photo detector to detect the approximate 660 and 810 nm wavelengths, and an indium gallium arsenide photo detector to detect the approximate 1300 nm wavelength. The sensor clip assembly 34 further includes two shrouds. One shroud 340 is on the inner housing piece of the emitter arm 344 subassembly and prevents ambient light from entering the blood chamber through the viewing windows. A second shroud 342 is on the inner housing piece of the detector arm 346 subassembly and also prevents ambient light from entering the blood chamber through the viewing windows. Shroud 342 contains an outer annular ledge or step surface 350 and an inner annular ledge or step surface 352. The difference in the heights of the step surfaces 350, 352 corresponds to the height of an annular wall on an exterior side of the blood chamber 32 (see FIG. 2), and also to the height at which a window surface is raised above a sunken well on one side of the blood chamber 32. Preferably, the shape and surface area of the outer annular step surface 350 substantially complements the shape and surface area of the respective shroud mating surfaces on the blood chamber 32 in order to maximize the blocking of ambient light. Shroud 340 is configured in a similar manner to mate with the opposing exterior wall of the blood chamber 32. Further detail regarding the structure and design of the casing for the sensor clip assembly 34 can be found in U.S. Provisional Application No. 61/553,078, U.S. Application No. 13/034,788, and U.S. Application No. 12/876,572. FIG. 5 depicts an internal view of the sensor clip assembly 34. In FIG. 5, the casing for the emitter arm 344 and the detector arm 346 is transparently depicted by the dotted lines. The emitter arm 344 includes an LED circuit board 148 and a transmitter and processor circuit board 150. The detector arm 346 of the sensor clip assembly 34 includes a detector circuit board 152, a receiver and communications board 154, and a power supply circuit board 156. A serial cable (e.g., S-232, USB, etc.) 158 is connected to the receiver and communications circuit board 154 and the power supply board 156 on the detector arm. The receiver and communications board 154 is connected to the transmitter and processor board 150, for example, via a pair of seven conductor ribbon cables 160. It will be appreciated that other types of serial cables, such as a cable having a NEMA 250 rated bayonet locking connector, may also be used. It will be appreciated that the particular configuration of boards and connectors depicted in FIG. 5 is merely exemplary. For example, all of the boards could be mounted into one arm or the other (except for the emitters and detectors, which should be mounted on opposing arms), or as in another embodiment described further below, where the sensor clip assembly 34 includes limited circuitry for processing the analog signals to raw digital data for transmission to an external host device by cable. FIG. 6 depicts a schematic diagram of a cross-section of the sensor clip assembly 34 clipped to a blood chamber 32. The housing for the sensor clip assembly 34 includes an inner housing frame 162 as well as outer housing shells 164, 166 for the emitter arm 144 and the detector arm 146, respectively. The inner housing frame 162 serves as the inner housing for both the emitter arm 144 and the detector arm 146. The bridge 102 spans between the portions of the inner frame housing corresponding to the emitter arm 144 and the detector arm 146. The bridge 102 includes an internal channel through which the pair of ribbon cables 160 passes. The inner housing frame 162 also includes a spring that spans both arms 144, 146 and the bridge 102 (the spring is not depicted). The spring biases the distal ends of the emitter arm 144 and the detector arm 146 towards one another so that they clip securely over the blood chamber 32. The outer shell 164 for the emitter arm 144 includes stanchions 170 which secure the LED circuit board 148 in the proper position on the emitter arm 144. Similarly, the outer shell 166 for the detector arm 146 includes stanchions 172 which secure the detector circuit board 152 in the proper position. communications circuit board 154. One end of the receiver and communications circuit board 154 is supported by the flexible ribbon cables 160, and the other end is supported by the molded rubber strain relief for the serial cable (e.g. USB) 158. The receiver and communications board 154 is also connected via jumper 184 to the detector board 152. This mounting arrangement enables the boards 154 and 156 to float in the housing compartment 176 and isolate the boards from potentially damaging vibrations. Components on the detector board 152 as well as the LED board 148 are encapsulated within epoxy to secure the components to the boards 152, 148 and protect the components from vibration damage. The transmitter and processor circuit board 150 is held by the flexible ribbon cable 160 and also jumper 180. Similarly, this mounting arrangement enables the board 150 to float in the housing compartment 174 in the emitter arm 144 and isolate the board 150 from potentially damaging vibrations. It will be appreciated that the shrouds depicted above in FIGS. 3-6 are most advantageous in extreme situations, such as when a patient has very low oxygen levels in venous blood. Thus, although FIGS. 3-6 depict shrouds for blocking ambient light, an alternative embodiment of the sensor clip assembly 34 depicted in FIGS. 3-6 may not include the shrouds for blocking ambient light as described above. Furthermore, it will be appreciated that the embodiment of the sensor clip assembly 34 depicted by FIGS. 3-6 is merely exemplary and that one skilled in the art would be able to modify the configuration of various components without departing from the inventive principles described herein. Turning now to FIG. 7, a general process for initializing and performing blood monitoring is depicted. At step 701 , a user first powers the monitoring system on, and, at step 703, the system is initialized, calibration parameters are loaded, control registers are configured, and system timers are started. The calibration parameters are initially determined after a sensor clip assembly is manufactured, and may be updated in the field when appropriate. Calibrations at the factory are initially completed by measuring absorptive filters constructed inside a blood chamber ("factory calibration filters"). These factory calibration filters are constructed of stable, light passing materials and built to provide reference points in absorption that correlate to actual transmission ratios found in blood. While a single factory calibration filter can be used, the preferred method is to use at least two factory calibration filters with different transmissive light values per wavelength such that calibration slopes (gains) and intercepts (offsets) can be established for each wavelength. These slopes and intercepts are stored in non-volatile memory (either in the sensor clip assembly 34 or in the external host device) and used in measurements to ensure the signals are accurately interpreted into blood values. It is common to verify that the calibrations are accurate by circulating human blood in a closed circuit and measuring the blood against a known measurement device such as a cell counter. This is done at different hematocrit and oxygen levels to validate the calibration of the sensor clip assembly 34. After the sensor clip assembly 34 is calibrated, it is assigned a unique verification filter that may be attached to the data cable or to an external host device that is interfacing with the sensor clip assembly. It is common practice that at least monthly, the user places the sensor clip on the paired unique verification filter and verifies that the sensor clip assembly 34 reads the same values from the filter as when it was calibrated. If the values fall within limits of the original measurement plus or minus a prescribed offset, then the sensor clip assembly 34 "passes" the verification test and is allowed to continue to function. If the measurements on the filter fall outside the limits, then the device is taken out of service. After a single verification failure, the user should clean the surfaces of the sensor clip assembly 34 and ensure the sensor clip assembly 34 is seated properly on the verification filter. Verification is attempted a second time. If it the device again fails, the option to field calibrate is presented to the user. With the sensor clip assembly 34 in place on the verification filter, an algorithm correlates the current value of measurement to that when the device was calibrated. New correction values are calculated and implemented in the software. If the sensor clip assembly 34 is too far out of the boundaries established for reliable field calibration, the device remains disabled and should be replaced. If the device successfully recalibrates, an additional verification test is made. Passing of the verification test places the unit back in service. where 8io is the light intensity of the photo receiver at 810 nm, z'noo is the infrared intensity of the photodetector at 1300 nm and Io-8 io and Io-noo are constants representing the intensity incident on the blood accounting for losses through the blood chamber. The above equation holds true assuming that the flow of blood through the blood chamber 32 is in steady state, i.e. steady pressure and steady flow rate. A second order polynomial is normally adequate as long as the infrared radiation incident at the first and second wavelengths is substantially isobestic. where i66o is the light intensity of the photo receiver at 660 nm, i810 is the intensity of the photodetector at 810 nm and I0-660 and I0-810 are constants representing the intensity incident on the blood accounting for losses through the blood chamber. The function g is a mathematical function determined based on experimental data to yield the oxygen saturation level, again preferably a second order polynomial. It may be useful to use a pair of second order polynomials depending on the hematocrit value or a separate 810 nm calibration for oxygen and hematocrit. Similar as in the case with the calculation for hematocrit, errors in the oxygen saturation value SAT can occur if there are errors in the measured intensity of the light at either the 660 nm or 810 nm wavelengths. After these calculations are performed, at step 71 1 , the resulting data is output by the sensor clip assembly through a serial port (e.g., such as a USB connector) to a device capable of displaying the data (e.g., a computer with a monitor). These steps of collecting raw data, calculating hematocrit, oxygen saturation, and blood volume change, and outputting the data through the serial port continue to be performed (i.e., the process loops back to node A at step 705) until the system is powered off at step 713. It will be appreciated that these steps may be occurring simultaneously (e.g., while certain raw data is being used in calculations or processed data is being output through the serial port, other raw data is being collected at the same time). As mentioned above, the collection of raw data, the calculation of hematocrit, oxygen saturation, and blood volume change, and the outputting of data through a serial port are all performed by components of the sensor clip assembly 34. Providing this functionality at the sensor clip assembly 34 advantageously allows analog signal data from the photodetectors to be collected and converted into digital signals without significant transmission losses, which in turn reduces the amount of noise present in output data that is ultimately displayed. Additionally, converting data into digital from within the sensor clip assembly 34 reduces the transmission distance of the analog signals, which reduces the amount of noise introduced by the analog transmission and allows suitable signal-to-noise ratios to be achieved at lower transmitter power. Thus, the system is able to drive the LED emitters with lower electrical currents, which lowers heat generation and extends the useful life of the LEDs, as well as the time needed between calibrations. Turning now to FIG. 8 , the general process of FIG. 7 will be described in greater detail with respect to the components of a sensor clip assembly 34. FIG. 8 depicts the communication of electrical signals in the context of the sensor clip assembly 34 (see FIGS. 5 and 6). There are a plurality of electrical connections 180 between the transmitter and processor circuit board 150 and the LED circuit board 148. The transmitter and processor circuit board 150 includes a microcontroller 182, which among other tasks controls the input current to the LED emitters on the LED board 148 via the conductors 1 80. As mentioned, the LED circuit board 148 preferably includes an LED emitting red light at about 660 nm, an LED emitting infrared light at about 810 nm and another LED emitting infrared light at about 1300 nm. The microcontroller 1 82 preferably includes a built-in A-D convertor. The microcontroller 182 controls the current output to the LEDs, preferably so that each LED outputs a calibrated known intensity at the respective wavelength. As mentioned above, the microcontroller 182 should be calibrated initially and re-calibrated when necessary to account for differences in output efficiency of the LEDs for each clip assembly. Alternatively, in a further embodiment, because the sensor clip assembly is relatively inexpensive to manufacture, the sensor clip assembly is simply replaced once the clip assembly falls out of calibration. Dashed line 178 depicts visible and/or infrared light being transmitted from an LED on the LED circuit board 148 to one of the photodetectors on the detector circuit board 152. The detector board 152 includes at least one silicon photodetector and at least one indium gallium arsenide photodetector. The microcontroller 182 implements a multiplexing routine so that LED emission is active and correlated to its respective received signal through the photo diodes for visible and infrared light. One example of multiplexing is the time based switching of each LED and matching detector for unique successive time periods resulting in time period measurements unique to each wavelength. This time based method is called commutation. A plurality of conductors connects the detector board 152 to the receiver and communications circuit board 154. The conductors 1 84 include paths to ground, as well as electrical connections to the anode and cathode of the silicon diode photodetector(s) and an electrical connection to the anode and cathode of the indium gallium arsenide diode photodetector(s). The signals from the photodetectors are normally relatively weak (in the μΑ range) with a poor signal to noise ratio. The receiver and communications board 154 includes transimpedance amplifiers 1 86 that convert the analog current signals (μΑ) from the silicon and indium gallium arsenide photodetectors into analog voltage signals (mV). The analog voltage signals from the transimpedance amplifier 1 86 are transmitted to digital trim pots 1 88.
synchronization of the trim pots 188 in order to ensure that proper time-based commutation occurs. The time-commutated, voltages signals from the trim pots 188 are transmitted to a summing junction. The composite time-commutated, voltage signal from the summing junction is then processed through signal filtering hardware 190 to strip noise from the analog voltage signal. The cleaned analog signal is then separated by the microcontroller 1 82 through line 192 to the built-in A-D converter where each signal is measured separately. These de-commutated signals represent the intensity of the visible and infrared light at the respective wavelength 660 nm, 810 nm, or 1300 nm as appropriate as depending on the time in the de-commutation process. The microcontroller 182 is programmed with the calibrated, ratiometric model (substantially as described in U.S. Patent No. 5,372, 136 mentioned above) to calculate the patient's hematocrit. It is also preferably programmed with a calibrated, ratiometric model to calculate the patient's oxygen saturation level. The HCT and SAT values are based on the detected signals from the silicon and indium gallium arsenide detectors that are filtered, de- commutated and calculated by the microcontroller 182. The ratiometric model for calculating the HCT is of the form of Eq. (3) referred to above, and is preferably a second order polynomial having a form as described in the above Eq. (4). The ratiometric model for determining the oxygen saturation level (SAT) is of the form of Eq. (5) above, and preferably is in the form of a second order polynomial as well. Although not depicted in Table I, it will be appreciated that an error detection protocol such as a checksum may be included in the output data stream. operator to customize the normal mode output data. Regardless of the flag setting the Hct, Sat, and Status will always be output. <o NN> where NN range "00"- "FF". rv Generate CLM "rvt" style output. Although not depicted in Table II, it will be appreciated that an error detection protocol such as a checksum may be included with the user commands. The USB cable 158 provides 5V USB power to the power supply board 156. The power supply board 1 56 conditions the power from the USB port, and isolates the electrical components on the sensor clip assembly 34 from direct connection to the USB power which may not be smooth enough for reliable operation of the sensor clip assembly. The power supply board 156 regenerates quiet and precise 5V and 3.3V power in order to facilitate reliable operation of the LED emitter and detector pairs as well as the other electronic components on the sensor clip assembly 34. The power supply board 156 uses switching regulators to convert between the 5V and the 3.3V power signals as needed. It has been found that the switching regulators are quite efficient and do not generate a significant heat load. FIG. 9 provides a functional block diagram of the sensor clip assembly 34 described above with respect to FIG. 8. The microcontroller 182 generates timing signals 903, 905 for both the transmitter and the receiver sections of the sensor clip assembly 34. The transmitter keys each wavelength of light in turn to illuminate the blood under test, and the resulting amplitude of each signal is measured by a corresponding detector diode. The measured amplitudes are then used to calculate the blood parameters. This method of signaling is termed time-domain multiplexing. While time-domain multiplexing in an exemplary embodiment is explained with more detail herein, it will be appreciated that other methods of multiplexing are possible. It will further be appreciated that the microcontroller 182 includes a tangible, non- transient computer-readable medium (such as flash memory, RAM, EEPROM, etc.) and that the operations performed by the microcontroller are pursuant to a processor executing computer- executable instructions stored on the computer-readable medium. After a first measurement is complete, the LED emitter with a wavelength sensitive to oxygen 941 is turned off for a period of time called a "guard band." This time allows for the receiver circuitry to settle back to the non-signal state and prevents residual signal from overlapping into a new measurement due to capacitor delays or ringing. After the guard band time, the next LED emitter, with a wavelength sensitive to hemoglobin 943, is turned on. The silicon detector 91 1 is again used as described above to perform the measurement. When this hemoglobin-related measurement is complete, the LED emitter 943 is turned off and another guard band time elapses. Then the LED emitter that is sensitive to water concentration 945 is turned on. This LED emitter 945 generates a wavelength that corresponds to the InGaAs photodetector 913. 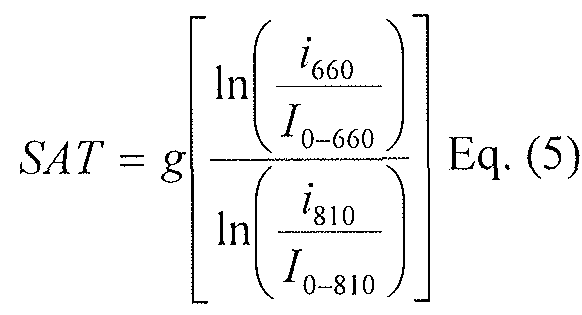 During this measurement, the gain of the silicon trimpot 188 is set to zero and the gain of the InGaAs trimpot 1 88 is set up to the required value to facilitate a DC measurement proportional to that channel's amplitude. communications cable such as the USB cable 158. It will be appreciated that the external host device may be a conventional personal computer with appropriate software, or other type of device incorporating USB hosting capabilities such as a PDA (personal digital assistant) or similar type of device capable of executing software for processing a data stream output from the sensor clip assembly 34. The operation of the microcontroller 182 with respect to synchronizing the operation of the LED emitters and photodetectors is described in further detail with respect to FIG. 10. "Wavelength λ- l " corresponds to the LED emitter that generates wavelength sensitive to oxygen, "Wavelength λ-2" corresponds to the LED emitter that generates wavelength sensitive to hemoglobin, and "Wavelength λ-3" corresponds to the LED emitter that generates wavelength sensitive to water concentration. As described above with respect to FIG. 9, a first LED emitter 941 corresponding to "Wavelength λ-l " is turned on, and the Silicon channel is simultaneously activated by appropriately adjusting the gains of the digital trimpots 188 (see Trace A and Trace B). Then, the first LED emitter is turned off and the Silicon channel is deactivated, and after a "guard band", a second LED emitter corresponding to "Wavelength λ-2" is turned on while the Silicon channel is simultaneously activated. Similarly, after the second LED emitter is turned off and the Silicon channel is deactivated, and after another "guard band," a third LED emitter corresponding to "Wavelength λ-3" is turned on while the InGaAs channel is activated. FIG. 10 further depicts data burst control timing in trace C. Due to the sensitivity of the analog signal conditioning circuits, it is advantageous to transmit digital data through the output port during the guard band such that the transmission of digital data does not interfere with the acquisition and conditioning of the raw analog signals. FIG. 10 further depicts that the LED current needed to operate each LED emitter may be different (as seen in Trace B). This process of time-domain multiplexing of the LED emitters and receiving channels is repeated throughout the course of data acquisition. In a further embodiment, as depicted in the functional block diagram of FIG. 1 1 , the calculation of the properties of blood and generation of control signals instead take place at an external device, such as a networked or stand-alone personal computer, and the sensor clip assembly 34 is responsible for acquisition of raw digital data (i.e., raw analog data generated by the photodetectors that has been conditioned and converted to digital format). The sensor clip assembly 34 of this embodiment includes LED emitters 941 , 943, 945, photodetectors 91 1 , 913, Silicon and InGaAs channels, a signal conditioning circuit 970 (including amplifiers 186, digital trimpots 1 88, and filter / detection circuit block 921 as described above with respect to FIG. 9), an analog-to-digital converter 931 , and a digital signaling cable 980 connected to an external host device. The sensor clip assembly 34 receives receiver control signals and outputs data over connectors 960, and receives emitter control signals over connectors 961. The sensor clip assembly 34 also receives power from the digital signaling cable 980. It will be appreciated that the sensor clip assembly 34 of this embodiment also reduces the transmission distance of the analog signals, which reduces the amount of noise introduced by the analog transmission and allows suitable signal-to-noise ratios to be achieved at lower power as described above. Turning to a further embodiment of the sensor clip assembly 34 depicted in FIGS. 8- 9, the sensor clip assembly 34 is connected via the USB cable 158 to a computer programmed with software to receive data from the sensor clip assembly 34 and to display it on a screen. Because the raw data is collected, converted to digital signals, and calculated at the sensor clip assembly 34, the computer is not subject to calibration requirements and need not include ratiometric calculation capabilities. FIG. 12 provides an exemplary demo software interface that allows the user to view data received from the sensor clip assembly 34, as well as to issue commands to the sensor clip assembly 34 (pursuant to computer-executable instructions being carried out by a software application being run by the computer). It will be appreciated that the demo software interface of FIG. 12 is merely exemplary and that the configuration and types of information and/or options presented to the user may be varied. For example, commercial software applications intended for a commercial user may include less information since a commercial user may not need to use the detailed status information or view the received data stream. The "COM Port" section 1 001 of the interface allows the user to select a COM number that corresponds to the sensor clip assembly 34 that the user wants to interact with. A single computer having multiple USB ports can accommodate more than one of the sensor clip assemblies 34, and thus multiple sensor clip assemblies may be connected to the computer at the same time. It will be appreciated that in a further embodiment, the software interface may allow information received from multiple sensor clip assemblies to be viewed simultaneously, as well as allowing for the simultaneous control of multiple sensor clip assemblies. In a further embodiment, the computer to which the sensor clip assembly 34 is connected may be wirelessly connected to a host computer that executes the software application to control one or more sensor clip assemblies 34 remotely over a wireless connection. The "Log File" section 1003 of the interface allows the user to store data received from the sensor clip assembly 34 in a log file at a user-designated (or automatically generated) location. The user can toggle this logging function on or off by checking the box next to the word "Log." 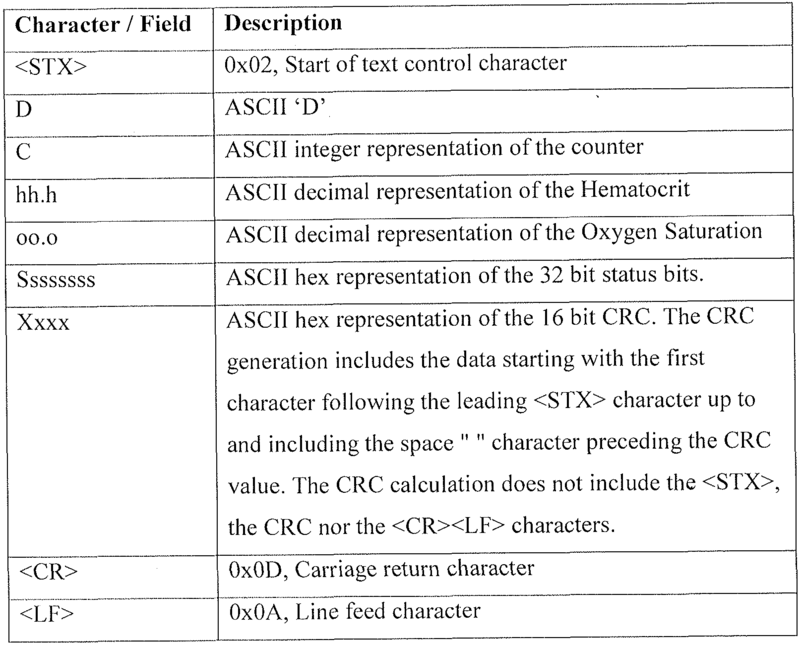 corresponding to the sensor clip assembly 34 from which data is being received, as well as "Count," "Met," "Sat," and "Status" information, corresponding to a count value, a Hematocrit value, an oxygen saturation value, and status information, respectively. The "Count" value is an approximate time counter. The user can check the "Count Flag" box to cause the count value to increment at one second intervals indefinitely. If the "Count Flag" box is not checked, the count value will roll over after it reaches a value of 9. The "Status Bits" section 1009 of the interface shows whether certain items are set or cleared based on the "Status" information received from the sensor clip assembly 34. The "Control Functions" section 101 1 of the interface provides a few commands that the user can issue to the sensor clip assembly 34. The "Verify" button provides the user with an option to verify or re-calibrate the sensor clip assembly 34. If the user chooses to verify that the device is still operating within a proper range, the sensor clip assembly 34 must be attached to the verification filter uniquely corresponding to that sensor clip assembly 34 in order for the verification to be accurate. As described above with respect to FIG. 7, if the verify function fails twice, then the system is out of service and eligible for field recalibration. Before the system can be recalibrated, the screen will display a prompt asking the user to confirm the ID of the verification filter to which the sensor clip assembly is fastened. If the sensor clip assembly is fastened to an incorrect verification filter, the recalibration cannot be performed. The "Turn LEDs Off button turns the LED emitters off (and changes to a "Turn LEDs On" button after the user has chosen to turn the LEDs off). Manually turning off all the LEDs when the sensor clip assembly 34 is not in use lengthens the service life of the sensor clip assembly 34. The "Reset" button resets the sensor clip assembly 34 (i.e., to step 701 of the process depicted by FIG. 7) without resetting the port connection (i.e., a reset does not re- enumerate the sensor clip assembly 34 on the USB port or otherwise affect the USB connection). The "Patient Run" section 1013 of the interface provides the user with the option to "Start Run," which causes the application to begin logging percent blood volume change (%BV Change), hematocrit (Hct), and oxygen saturation (Sat) values once a minute to a delimited text file which may be manipulated, for example, by a spreadsheet or database application (distinct from the log file shown in the "Log File" section 1003 of the interface). The name of the file is shown in the window next to the "Start Run" or "End Run" button. FIG. 12 shows a patient run that is currently in progress, and thus the "Start Run" button had previously been pressed and an "End Run" button is currently displayed to the user. The graphs in the "Patient Run" section 1013 of the display are a graphical representation of the data stored in the text file, and allow the user to visually monitor the %BV, Hct, and Sat values over time. In the "Exit" section 1015 of the interface, the user can exit the software application by clicking on the "Exit" button. FIGS. 13A-F depict an exemplary user interface of a software application for commercial users of a sensor clip assembly 34 pertaining to verification and recalibration. FIG. 13 A shows the user interface presented to the user after the user has chosen to verify the accuracy of a sensor clip assembly 34 and the verification has failed (i.e., the readings of the sensor clip assembly 34 are not within a predetermined tolerance range). As shown in FIG. 13A, the user is notified that the accuracy verification has failed and is advised to ensure that the sensor clip assembly is properly attached to the verification filter and to ensure that the verification filter is clean. After the user presses "OK" and tries to verify the accuracy of the sensor clip assembly 34 again, and the verification again fails, the user is presented with the interface shown in FIG. 13B, which notifies the user that the verification has failed and gives the user the option to attempt a field calibration, If the user selects "Yes" in the interface shown in FIG. 13B, the user is taken to the screen shown in FIG. 13C, which notifies the user that the user will need to enter the identification code corresponding to the verification filter (which is a serial number that can be obtained from the verification filter itself). After the user presses "OK," the user is prompted to enter the identification code as shown in FIG. 13D The software then compares the entered identification code with an identification code corresponding to the sensor clip assembly 34 obtained from the sensor clip assembly 34 or previously stored in the external host device, and if a match is found, the user is notified that the entered identification code has been accepted as shown in FIG. 13E. After the user presses "OK" in the screen shown in FIG. 13E, the sensor clip assembly 34 is field recalibrated and the software once again tries to verify the accuracy of the sensor clip assembly 34. If this verification after field recalibration fails, the user will be notified that the sensor clip assembly 34 (called a "Crit-Line sensor clip" in this example) needs to be replaced, as shown in FIG. 13F. The user may attempt additional field recalibrations. It will be appreciated that, with respect to the embodiment of the sensor clip assembly depicted in FIG. 1 1 , the software applications described above with respect to FIGS. 12 and 13A-13F may be modified to receive raw digital data from the sensor clip assembly 34, perform ratiometric calculations based on the received raw digital data, display similar results to a user, and to be verified and recalibrated as described above. While the embodiments described above have focused on the collection of data regarding percent blood volume change, hematocrit values, and oxygen saturation values, it will be appreciated that other types of LED emitters paired with the same or other types of photodetector diodes may be used to measure other types of parameters. The use of the terms "a" and "an" and "the" and similar referents in the context of describing the invention (especially in the context of the following claims) are to be construed to cover both the singular and the plural, unless otherwise indicated herein or clearly contradicted by context. The terms "comprising," "having," "including," and "containing" are to be construed as open-ended terms (i.e., meaning "including, but not limited to,") unless otherwise noted. Recitation of ranges of values herein are merely intended to serve as a shorthand method of referring individually to each separate value falling within the range, unless otherwise indicated herein, and each separate value is incorporated into the specification as if it were individually recited herein. All methods described herein can be performed in any suitable order unless otherwise indicated herein or otherwise clearly contradicted by context. The use of any and all examples, or exemplary language (e.g., "such as") provided herein, is intended merely to better illuminate the invention and does not pose a limitation on the scope of the invention unless otherwise claimed. No language in the specification should be construed as indicating any non- claimed element as essential to the practice of the invention. 1. A sensor clip assembly for optically monitoring blood flowing through a blood chamber, the sensor clip assembly comprising: a housing having two opposing arms capable of being fastened to a blood chamber; at least one emitter in one of the opposing ends; at least one photodetector in the other opposing end positioned relative to the at least one emitter such that light emitted by the at least one emitter is capable of being received at the at least one photodetector after passing through a blood chamber to which the sensor clip assembly is fastened; a microcontroller within the housing configured to receive conditioned analog signals, wherein the conditioned analog signals are based on raw analog signals generated by the at least one photodetector, to convert the conditioned analog signals to raw digital data, and to calculate at least one parameter corresponding to blood in a blood chamber to which the sensor clip assembly is fastened based on the raw digital data; and an output port configured to output from the sensor clip assembly results of calculations performed by the microcontroller to an external device. 2. The sensor clip assembly of claim 1 , wherein the raw analog signals generated by the at least one photodetector are analog current signals, and the sensor clip assembly further comprises: at least one transimpedence amplifier within the housing corresponding to each photodetector for converting the raw analog signals to analog voltage signals; and at least one digitally-controllable trimpot within the housing corresponding to each photodetector for applying a gain to the analog voltage signals. 3. The sensor clip assembly of claim 2, wherein the microcontroller is further configured to control operation of the at least one emitter, and to control the gain applied by the at least one digitally-controllable trimpot in a manner that is synchronized with the operation of the at least one emitter. 4. The sensor clip assembly of claim 1 , wherein at least one of the emitter arm and the photodetector arm includes a shroud for blocking ambient light from being received at the at least one photodetector. 5. The sensor clip assembly of claim 1 , comprising a silicon photodetector and an Indium-Gallium-Arsenide photodetector, and wherein the microcontroller is configured to calculate a hematocrit value, an oxygen saturation value, and a percent blood volume change. 6. The sensor clip assembly of claim 1 , wherein the output port corresponds to a USB (Universal Serial Bus) connection. 7. The sensor clip assembly of claim 1 , wherein the external device is a computer. 8. The sensor clip assembly of claim 1 , wherein the output port is further configured to transmit commands received from the external device to the microcontroller. 9. The sensor clip assembly of claim 8, wherein the microcontroller is further configured to verify accuracy of the sensor clip assembly based on a verification filter uniquely associated with the sensor clip assembly upon receiving a corresponding command from the external device. 10. The sensor clip assembly of claim 9, wherein the microcontroller is further configured to recalibrate the sensor clip assembly upon confirming user input of a correct verification filter identification code. 1 1. The sensor clip assembly of claim 1 , wherein the microcontroller is part of a board floated within one of the two opposing arms. microcontroller from the sensor clip assembly to an external device; and the external device, configured to display the results of the calculations performed by the microcontroller to a user. 13. The system of claim 12, wherein the emitter arm and the photodetector arm are opposing arms biased together at first opposing ends of the arms to form a jaw such that a pinching force applied to second opposing ends of the arms opens the jaw to allow the blood chamber to placed between the first opposing ends and held there when the force is removed. 14. The system of claim 12, wherein the chamber body of the blood chamber is tinted blue so as to block ambient light from being received at the at least one photodetector. 15. The system of claim 12, further comprising: a verification filter uniquely associated with the sensor clip assembly for determining whether recalibration of the sensor clip assembly is needed. 16. The system of claim 15, wherein the output port is further configured to transmit commands received from the external device to the microcontroller; and wherein the microcontroller is further configured to verify accuracy of the sensor clip assembly based on the verification filter and to recalibrate the sensor clip assembly upon confirming user input of a correct verification filter identification code. 17. The system of claim 12, wherein the microcontroller is part of a board floated within one of the emitter arm and the photodetector arm. 18. A sensor clip assembly comprising a microcontroller, an emitter, and a photodetector, the microcontroller further comprising a processor and a tangible, non-transient computer-readable medium having computer-executable instructions for optically monitoring blood stored thereon, wherein the computer-executable instructions comprise: instructions for turning the emitter on, wherein the emitter corresponds to the photodetector; instructions for synchronizing conditioning of raw analog signals generated by the photodetector on a channel corresponding to the photodetector with operation of the emitter; instructions for calculating at least one parameter corresponding to blood based on raw digital data converted from conditioned analog signals , wherein the conditioned analog signals are based on the raw analog signals generated by the photodetector; and instructions for outputting results of calculations to an external device via an output port. 19. The sensor clip assembly of claim 18, wherein the computer-executable instructions further comprise: instructions for controlling an amount of gain applied by a digitally-controllable trimpot on the channel corresponding to the photodetector. 20. The sensor clip assembly of claim 1 8, wherein the computer-executable instructions further comprise: instructions for verifying accuracy of the sensor clip assembly based on a verification filter uniquely associated with the sensor clip assembly upon receiving a corresponding command from the external device. 21. The sensor clip assembly of claim 20, wherein the computer-executable instructions further comprise: instructions for receiving a user input of a verification filter identification code; and instructions for recalibrating the sensor clip assembly if the verification filter identi fication code input by the user corresponds to the verification filter uniquely associated with the sensor clip assembly. 22. The sensor clip assembly of claim 18, wherein the computer-executable instructions further comprise: instructions for outputting status information corresponding to the sensor clip assembly to the external device. 23. The sensor clip assembly of claim 18, wherein the instructions for outputting results of calculations to an external device via an output port further comprise: instructions for outputting a data stream including information pertaining to a hematocrit value, an oxygen saturation value, and a percent blood volume change. 24. A sensor clip assembly for optically monitoring blood flowing through a blood chamber, the sensor clip assembly comprising: a housing having two opposing arms capable of being fastened to a blood chamber; means for fastening the housing to the blood chamber; at least one emitter in one of the opposing ends; at least one photodetector in the other opposing end positioned relative to the at least one emitter such that light emitted by the at least one emitter is capable of being received at the at least one photodetector after passing through a blood chamber to which the sensor clip assembly is fastened; a signaling conditioning circuit configured to apply a gain to and to filter noise from raw analog signals generated by the at least one photodetector; an analog-to-digital converter configured to convert conditioned analog signals to raw digital data; and an output port configured to connect the sensor clip assembly to an external device. 25. The sensor clip assembly of claim 24, wherein the signaling conditioning circuit comprises at least one transimpedence amplifier, at least one digital trimpot, and a filter circuit. 27.. The sensor clip assembly of claim 24, further comprising: a microcontroller within the housing configured to calculate at least one parameter corresponding to blood in a blood chamber to which the sensor clip assembly is fastened based on the raw digital data; and wherein the output port is further configured to output results of calculations performed by the microcontroller from the sensor clip assembly to the external device. 28. The sensor clip assembly of claim 27, wherein the output port is further configured to transmit commands received from the external device to the microcontroller; and wherein the microcontroller is further configured to verify accuracy of the sensor clip assembly based on a verification filter uniquely associated with the sensor clip assembly upon receiving a corresponding command from the external device. 29. The sensor clip assembly of claim 28, wherein the microcontroller is further configured to recalibrate the sensor clip assembly upon confirming user input of a correct verification filter identification code. 30. The sensor clip assembly of claim 27, wherein the microcontroller is part of a board floated within one of the two opposing arms. device; and the external device, configured to receive data from the sensor clip assembly via the output port. 32. The system of claim 3 1 , wherein the signaling conditioning circuit comprises at least one transimpedence ampli fier, at least one digital trimpot, and a filter circuit. 33. The system of claim 31 , wherein at least one of the photodetector arm and the emitter arm includes a shroud for blocking ambient light from being received at the at least one photodetector. 34. The system of claim 31 , wherein the chamber body of the blood chamber is tinted blue so as to block ambient light from being received at the at least one photodetector. 35. The system of claim 31 , wherein the sensor clip assembly further comprises: a microcontroller within the housing configured to calculate at least one parameter corresponding to blood in a blood chamber to which the sensor clip assembly is fastened based on the raw digital data; and wherein the output port is further configured to output results of calculations performed by the microcontroller from the sensor clip assembly to the external device. 36. The system of claim 35, further comprising: a verification filter uniquely associated with the sensor clip assembly for determining whether recalibration of the sensor clip assembly is needed. 37. The system of claim 36, wherein the output port is further configured to transmit commands received from the external device to the microcontroller; and wherein the microcontroller is further configured to verify accuracy of the sensor clip assembly based on the verification filter and to recalibrate the sensor clip assembly upon confirming user input of a correct verification filter identification code. 38. The system of claim 35, wherein the microcontroller is part of a board floated within one of the emitter arm and the photodetector arm. 39. The system of claim 3 1 , wherein the external device is further configured to receive the raw digital data from the sensor clip assembly via the output port and to calculate at least one parameter corresponding to blood in a blood chamber to which the sensor clip assembly is fastened based on the digital data. 40. The system of claim 39, wherein the external device is further configured to verify accuracy of the sensor clip assembly based on a verification filter uniquely associated with the sensor clip assembly, and to recalibrate the sensor clip assembly upon confirming user input of a correct verification filter identification code. photodetector; instructions for synchronizing operation of the signal conditioning circuit with operation of the emitter corresponding to the photodetector; instructions for receiving, from the sensor clip assembly, raw digital data converted by the analog-to-digital converter from conditioned analog signals based on raw analog signals generated by the photodetector; and instructions for calculating at least one parameter corresponding to blood based on the raw digital data. 42. The computing device of claim 41 , wherein the computer-executable instructions further comprise: instructions for controlling an amount of gain applied by the signal conditioning circuit. 43. The computing device of claim 41 , wherein the computer-executable instructions further comprise: instructions for verifying accuracy of the sensor clip assembly based on a verification filter uniquely associated with the sensor clip assembly. 44. The computing device of claim 43, wherein the computer-executable instructions further comprise: instructions for receiving a user input of a verification filter identification code; and instructions for recalibrating the sensor clip assembly if the verification filter identification code input by the user corresponds to the verification filter uniquely associated with the sensor clip assembly. 45. The computing device of claim 41 , wherein the computer-executable instructions for calculating at least one parameter corresponding to blood based on the raw digital data further comprise: instructions for calculating a hematocrit value, an oxygen saturation value, and a percent blood volume change corresponding to the blood. MX2013005626A MX347286B (en) 2010-11-17 2011-11-17 Sensor clip assembly for an optical monitoring system. FR2680318B1 (en) 1991-08-14 1994-01-21 Hospal Industrie Kidney machine and control method thereof.